The adventures of an overgrown kid in his forties with three crazy little boys, and a very patient wife. 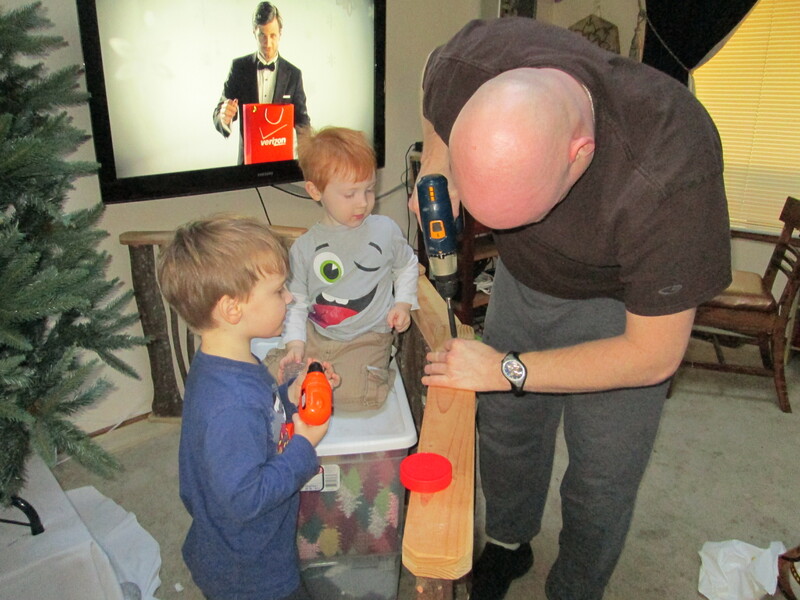 I’ve learned over the years that the boys absolutely love “helping” me whenever I work on a project around the house. It doesn’t matter if I’m cleaning the garage, building a fence, or just doing the dishes. Whatever it is that I’m doing they want to be involved in it. Since there is little to no chance of discouraging my stubborn little monsters I’ve come up with a few helpful strategies that I thought I’d share with other Dad’s out there. Whenever you do any task it’s important to have close supervision. What this means is that I’ve learned that anything done with kids hanging around is going to take much, much longer than planned. Interruptions have a way of doing that. Even if the boys are actively “helping”, there is constant stopping to break up fights, put shoes back on, change butts, and kiss boo-boos. What I had thought was going to be a weekend long job, could stretch out over several days. There’s no way to predict how much additional time will be needed, so it’s best to plan for the worst and then be pleasantly surprised if it didn’t take weeks to finish something that could have been done in an afternoon. 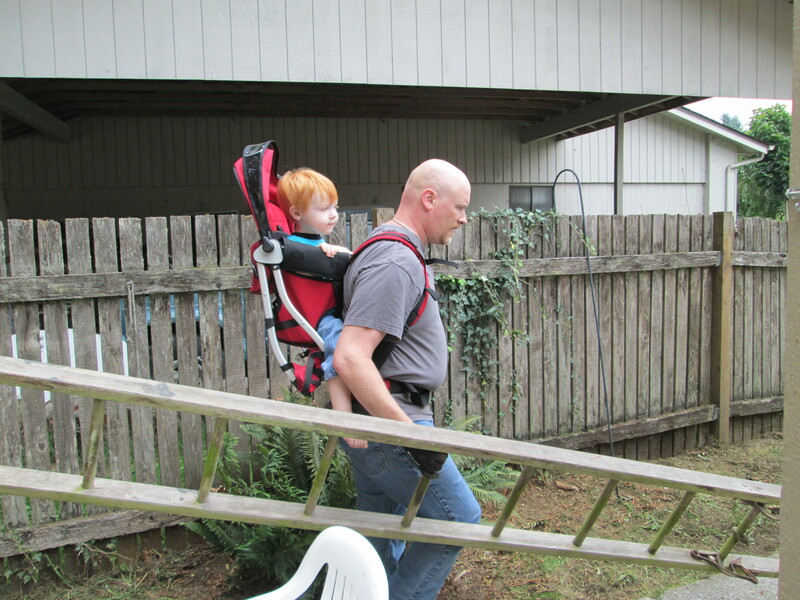 The boys “help” me disassemble our Christmas fence. 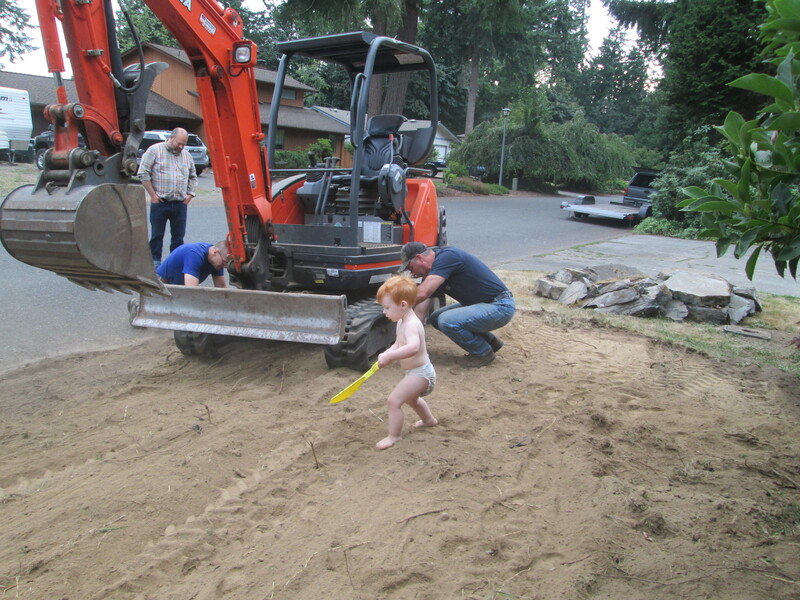 Zack is ready to jump in with his toy drill in case I need a relief. When I work on a project and I know the kids are going to be underfoot (which is pretty much every project) I make sure to have plenty of extra screwdrivers, tape measures, or whatever else I’m using handy or better yet, toys that look like what I’m using. Inevitably I’ll reach for something only to discover one of my little kleptomaniacs has run off with it or is by my side happily playing with that one crucial tool that I needed. Having toy facsimiles or extra “stunt” tools lets them have fun while helping me keep my sanity. 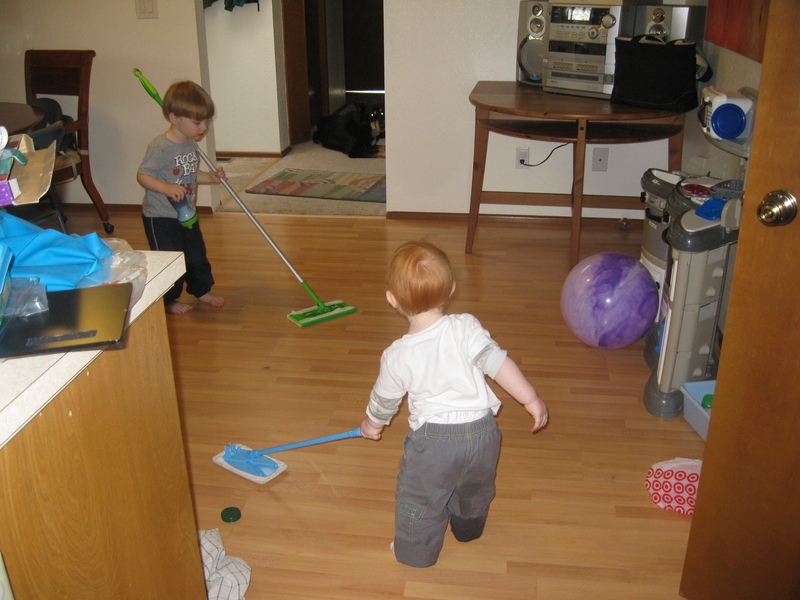 The boys have amassed quite a collection of miniature tools, vacuums, brooms, and other household items. As an added bonus, this has made huge difference with Zack’s sensory disorder. This kind of play demystifies the sounds that these items make which helps him cope with noises that may have previously frightened him. Zack mans the full size swiffer while Josh has the kid sized version. As an added bonus, they may accidentally get the floor clean too! While my little guys are still a bit too young to offer much real help, that doesn’t mean they don’t want to. When I plan a project I try to find things that they can do to feel involved. It’s amazing how excited they get just doing a small task like dumping the dustpan, handing me screws, or putting loose nails in a jar. It can be tricky because the novelty of actually helping wears out quick and they’ll start entertaining themselves by just getting in the way. Having a little project of their own goes a long ways towards keeping kids happy. 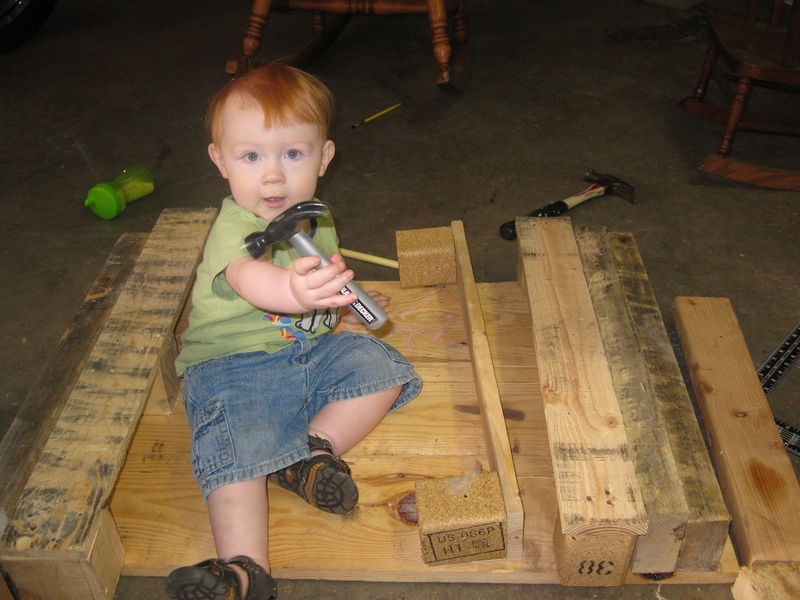 If the kids see me busy pulling nails for instance, I’ll make sure that they have a few boards of their own (minus the nails of course) to pound on with toy hammers and pretend to pull out their own nails. Josh loves to “help” me do dishes, which in his case involves standing on a chair next to me endlessly pouring water from one cup into another while I scrub all the dishes. 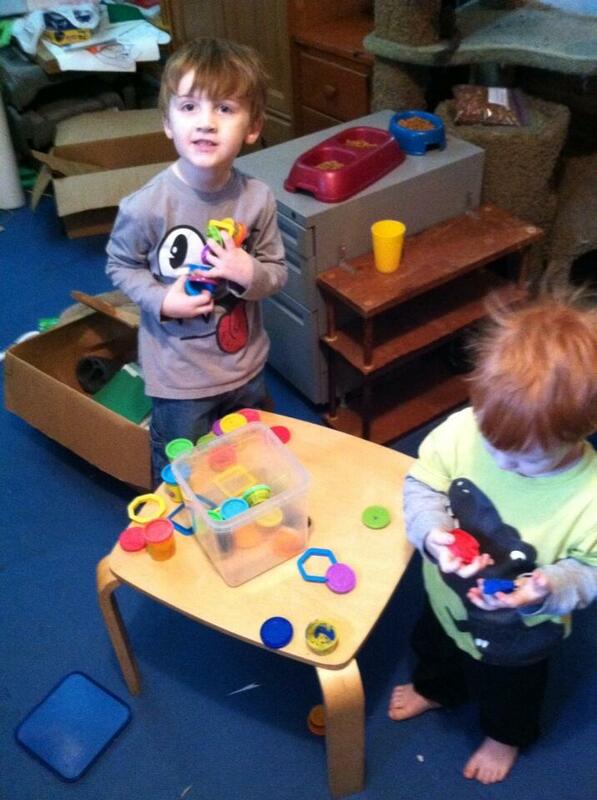 The guys take a Play-Doh break while helping Mom & Dad clean and organize the garage. No matter what their level of fascination is with what Daddy is doing, they are bound to eventually tire of what I’m working on and want to be entertained (by me). This can get awkward, especially if I’m still knee deep in the task at hand and I can’t break away from it. Having a backup plan ready can be a life saver. Just about anything qualifies as a “back-up”. The only rule is to make sure it’s something the kids really enjoy, doesn’t need lots of direct supervision, and will keep them in the immediate area (Play-Doh, coloring books, snacks, sidewalk chalk, etc.). A few well timed granola bars and a magna-doodle can be a real life saver. 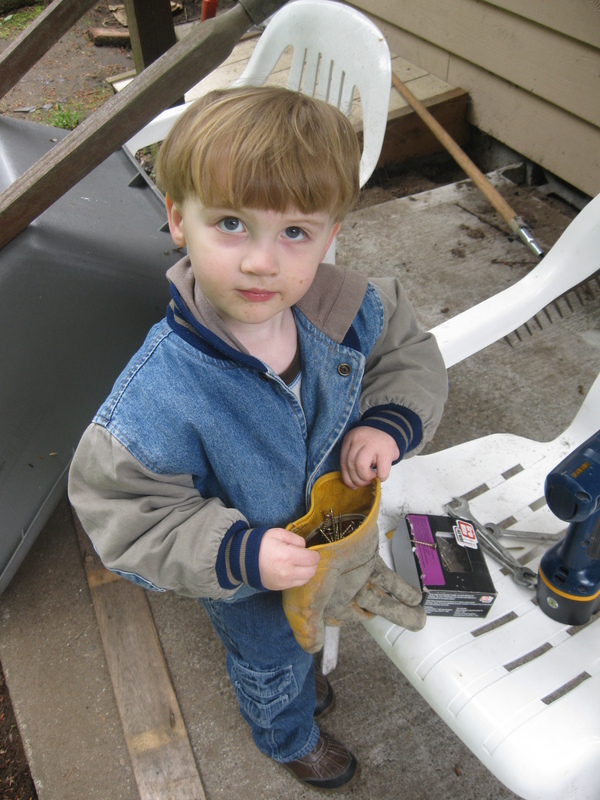 Zack decides to “help” by filling one of my work gloves full of fencing nails. I would have put “Patience” and “Sense of Humor” on this list too, but I think it’s a given. As with everything involving kids, having a lot of patience and a sense of humor is a must. Try not to stress out, appreciate the ridiculousness of the situation and enjoy the chaos that is unfolding around you. Why is your brother crying? Like Random Dadisms on Facebook!